I've been a fan of Resident Evil since I was first attacked by a pack of dogs jumping through a hallway window in my middle school years. And like many long-time fans, I prefer the survival horror Resident Evils to the action horror ones. From what I saw at TGS today, Resident Evil Revelations 2 is right up my alley. Resident Evil Revelations 2 is not a direct sequel story-wise to the first Resident Evil Revelations. Instead, it is a thematic sequel, calling back to not only the original Revelations but the classic games as well. You move through cramped, spooky areas while confronting zombie-like creatures singly or in small groups. Ammo conservation is important, as is finding keys to the myriad of locked doors. The demo begins with Resident Evil 2 heroine Claire Redfield waking up, locked in a dilapidated prison with a glowing bracelet around her wrist. However, when she reaches for the cell door, it opens automatically. Down the prison corridor she finds the game's other player character, Moira Burton—daughter of Barry Burton—locked in a cell, which unlocks as Claire approaches. Together the two explore, look for a way out, and kill more than a few “zombies”—all while being monitored by a mysterious antagonist via the prison's security cameras. At any time during the demo, you can switch between Claire and Moira with the press of a button—and you will need to switch often. Claire's role is one of combat as she is proficient in firearms. Moira, on the other hand, holds the flashlight—a quite vital role in the dark remnants of the prison. Out of combat, she is able to find otherwise hidden items like keys and ammo. She also carries a crowbar, allowing her to open doors Claire cannot. But while she refuses to use a gun (a plot point in the demo) that doesn't mean she is useless in combat. Moira can use the flashlight to blind enemies—allowing Claire to melee them—as well as sneak up on enemies and demolish them from behind with her crowbar. It is the dichotomy of how the two characters play that gets me the most excited about this game—especially when it comes to co-op. While I was unable to try it out for myself, local co-op for the game has been announced where one player plays Claire and the other Moira. And personally, I love the idea of a co-op game where, instead of the two characters being cookie cutter copies of each other when it comes to how they play—like, say, Chris and Sheva in RE5—the two characters play completely different from one another. Neither is useless and when played together in tandem, they make a formidable team. All in all, Resident Evil Revelations 2 reminds me most of the Lost in Nightmares DLC for Resident Evil 5—and that is a high compliment. It clearly goes back to the series' roots all while keeping many of the modern gameplay features and adding an awesome co-op aspect to the game. So if co-op survival horror piques your interest, this is one to watch. 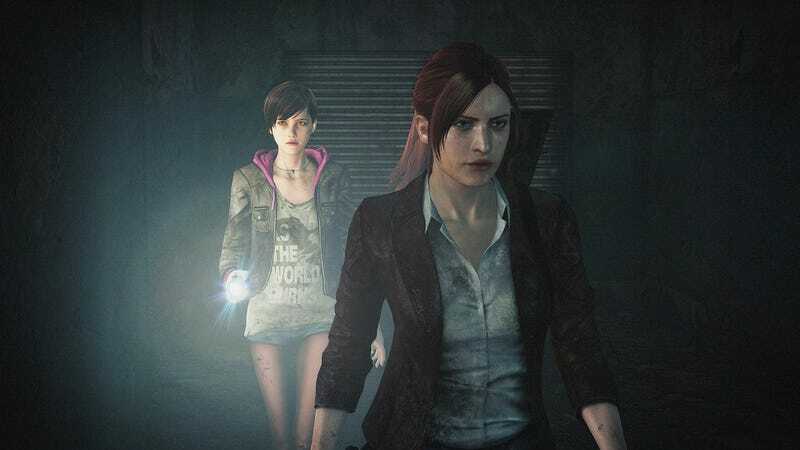 Resident Evil Revelations 2 will be released episodically in North America sometime in 2015 for PlayStation 3, PlayStation 4, Xbox 360, Xbox One, and PC.